With my girlfriend, soon to be my wife, on our way to her village in Troodos area. Royal Marine commandos (presumably of Welsh origin) had been operating in the area against EOKA. My mother and sister pay homage to the saint. Not what many people think of when they think of a holiday in Cyprus. Troodos is over one mile high, these scenea are not uncommon in the winter. Not what many people think of when they think of a holiday in Cyprus. 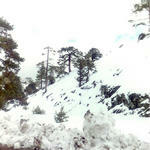 Troodos is over one mile high, these scenea are not uncommon in the winter. There is even a ski resort today.